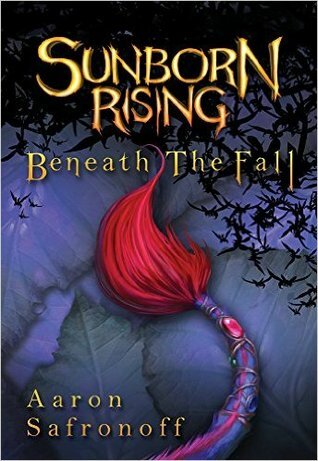 Sunborn Rising:Beneath the Fall by Aaron Safronoff. Neoglyphic Entertainment, 2016. Softcover/Paperback. 385 pages. Sunborn Rising is an exciting, inventive novel that combines gorgeous artwork with thrilling text. This book felt like so much more than just a book. It honestly felt more like an entire new world, full of unique, vibrant characters and an incredibly in-depth, expansive world that I am eager to learn more about. Sunborn Rising introduces a unique world unlike any I've ever read about;-- Where the descriptions occasionally lacked, the images completely made up for. I really enjoyed the entire basis of the plot surrounding Cerulean and how the world came to be the way it currently is (keeping it vague so as not to say too much in case of spoilers). The Creepervine was wonderfully creepy and added a really great dimension to the various elements within the world. Another aspect as this story that I enjoyed was the large variety of characters. Safronoff has created a medley of interesting species that interact with one another and each seems to truly have their own unique culture and personality. The dialogue was, for the most part, written well and realistically, though there were a few occasions where it felt a bit jilted. The characters felt extremely realistic and human (despite not being human), and I enjoyed getting to know each one's personality. Barra, for instance, is strong-willed, rather stubborn, and somewhat emotional. I began to see the similarities and inherited traits Barra shared with her mother, Brace, which I felt strengthened the mother-daughter connection. The only issues I had with Sunborn Rising were the seemingly random POV changes and the sometimes awkward writing. The POV changes seemed to come at random moments with little to no warning; at times a new chapter would change the POV, at other times it would just be a page break. I wouldn't have minded the switches as much if they were done more consistently, rather than having one character narrate for a long while and then suddenly switch over to someone else. The writing was also occasionally a bit abrupt or awkward, which I feel is something some extra editing could easily fix, but overall it was minimal enough that it did not interrupt my enjoyment of this book too much. If you like action books, then this is for you. I have a sort of love-hate relationship with action, personally, because I just tend to get bored when there is too much fast-paced action and not enough dialogue or description. Sunborn Rising is constantly moving, which I think would make this perfect for its targeted age range, plus anyone else who prefers a more fast-paced and thrilling story. After checking out Neoglyphic Entertainment's site, I'm really excited about their work in general. I'm intrigued by this idea of "marrying art and science" because it just seems to open so many doors and combine so many different areas into well-rounded masterpieces. Also, it looks like they are working on even more (goodies) to go with this book, such as games and animated media, which I find extremely exciting. Overall, I am giving Sunborn Rising four stars for its delightful, expansive fantasy world and page-turning abilities. I would highly recommend this for someone looking for a unique fantasy story with gorgeous graphics to accompany it.